At the beginning of the winter season, I made it my mission to ensure that everyone in my family was introduced to fun in the snow by learning to ski. We visited Ontario’s Blue Mountain in January where I got C out on the hills for an introduction to daredevil-ism. In February, we headed out west to Kelowna, British Columbia to visit my Dad. Nestled in a valley in the middle of BC’s beautiful Rocky Mountains, Kelowna is known for its spectacular vineyards, orchards, wildlife and beautiful scenery. In the winter, it is a hotbed of activity for those who love skiing and snowboarding. On our planned ski day, we awoke early to start the one hour drive through Kelowna and up the mountain towards Big White Ski Resort. 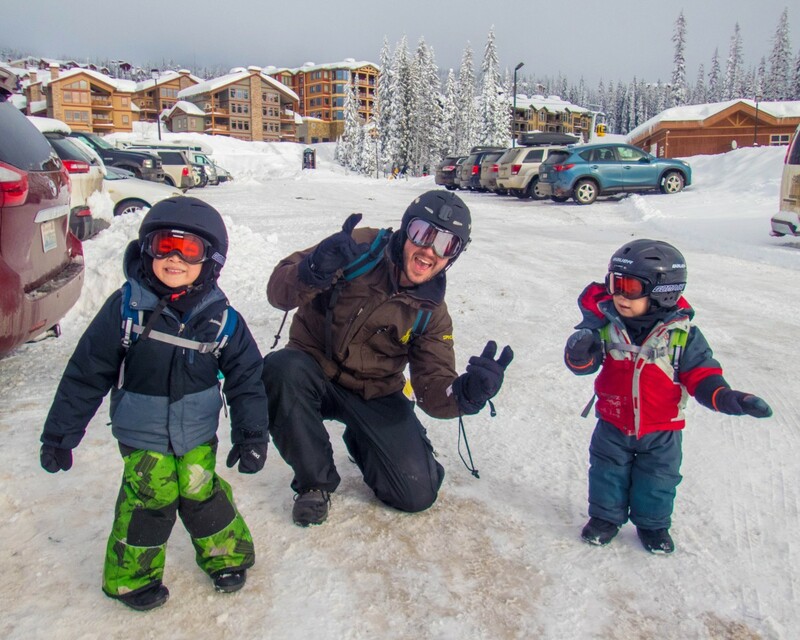 Big White was recently ranked the number one family ski resort by Ski Canada Magazine. As we drove up the mountain the difference between it and the valley became pretty obvious. Kelowna in the winter is generally a pretty grey and cloudy place with temperatures that hover a few degrees above freezing. As we climbed higher and higher the snow on the side of the road began to accumulate and before long the banks on either side of the road were twice as high as our rental car and we witnessed the snowplows regularly working their way up and down the mountain. The switchbacks became sharper as our vertical got higher and before we knew it we were pulling into the lot and donning our gear. We made our way to the Gondola and up the hill to the main lodge to get our passes and sign up for lessons. 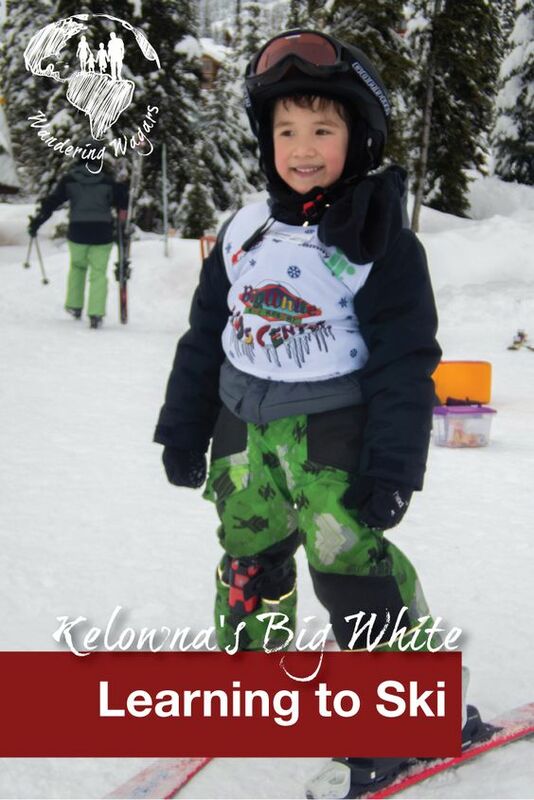 Big White offers a variety of ski courses for ages 2 years and up, and that was just perfect for us! With D being 2 and the rest of us being up, we fit right into the demographic! Christina signed up for an adult half day beginner group lesson (2 hours – $69) and C got set up for a half day, toddler group lesson (2 hours – $69) while for D, we opted for the Tot Town Daycare Plus program ( 8:30 AM-4:00 PM includes snacks, lunch, activities and a one hour private lesson – $125). We hit the rental area and got ourselves sorted out. Because snowboard equipment and ski equipment are arranged separately it took us a lot of time to get our rentals organized. This was made even longer due to toddler equipment rentals being in a whole other area as well. By the time we got the rentals finished, a good portion of our morning had been eaten up and I was rushing to get D to the Tot Town before the 11:30 AM-1:00 PM dead zone for drop offs (the dead zone is likely due to ensure that no one interrupts the children’s lunch and nap times). I’d be lying if I didn’t say that I found the whole rental process to be stressful. 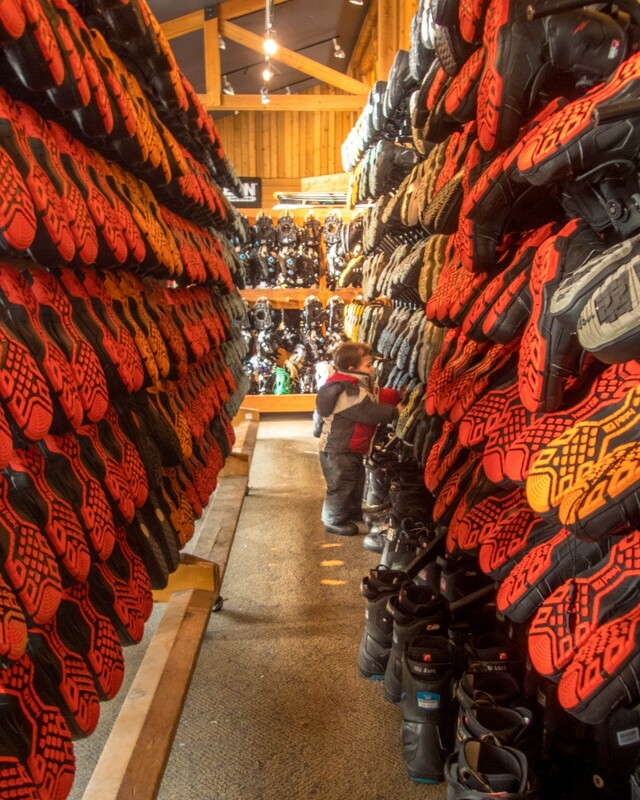 The snowboard and ski sections were in the same room, but managed separately, so you had to go through each section individually if you were caring for kids. In the end getting lift passes and rentals ate up almost two hours of our precious time in the snow. After getting D settled in Tot Town I made my way back to the rental lodge and met up with Christina and C to get our day started. We had an hour before the lessons began and C, always eager to get started asked if he could go with me on the bunny hill. Never one to turn down a chance to ride the snow, he and I made our way outside and got ready to ride. C had been with me once in Ontario, but I had forgotten just how big the hills were out west. Hummingbird, the green (easy) hill starting in the centre of the village was as long as any hill in Ontario! C took the hill like a champ and ripped through the turns in full snowplough. We made it to the bottom just in time to head down the gondola and catch D’s lesson and watch him take his first ride down the mountain. D was a rock-star in his lesson. His instructor, Austin, was incredibly patient during his hour on the baby hill and helped pull him up after his runs. At 2 and a half years old he was even able to balance himself after almost falling. Teaching a 2-year-old to stop is basically impossible, so they set up some soft train shaped bumpers at the bottom that D loved bowling over at the bottom of the hill. He would laugh hysterically whenever he crashed into them. Once C and Christina were settled in their lessons I hit the lifts for a ride. I only board about once a year if I’m lucky and I didn’t get out at all the previous year, so it was a treat getting out for a second time and into a place with great powder and awesome runs. I wound my way through the trees and moguls. I even had a chance to catch Christina and C getting in their lessons. C, by now basking in his deep experience of 4 complete hill runs was up on the child beginner hill tearing down like he owned the place. To great credit, his instructors quickly noticed that he was performing too well for the beginner class and moved him to the adult hill where he was soon skiing alongside his mother and had a private instructor rather than the group lesson that he signed up for. The instructor had him doing hops and turns and learning how to stand up and put on his own skis. 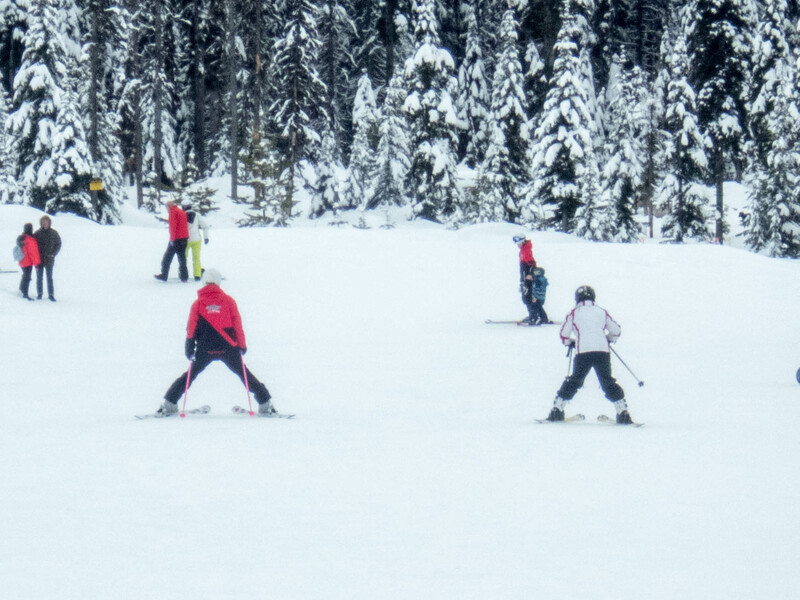 The ski instructors placed a lot of emphasis on self-reliance which, as a parent, is incredibly helpful. Constantly climbing back up the hill to help put on a lost ski takes the fun out of a day on the hill pretty quickly. 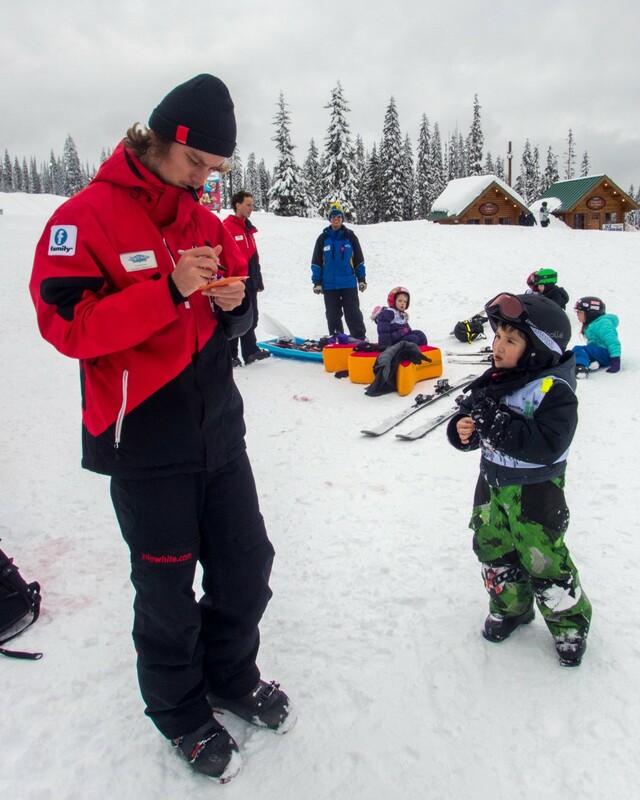 The children taking lessons in Big White are given ankle bracelets to help track them while they are on the hill. This tool works as a security precaution should a child go missing, but also as a fun reminder of the experience. Parents get an e-mail a few days after the lesson with the child’s ski paths and speed noted on a map. This makes for a fun tool to chat with your kids about their experience on the hills. Christina was experiencing her time learning to ski and was a little apprehensive about hitting the hills for the first time on such a big mountain. Luckily for her, the beginner’s area of Big White is a low grade, long and slow run that makes it easy to get started and figure out the basics. The training hill is separated into two areas, one for child beginner classes with a small short run and bumpers at the bottom to catch out of control daredevils who forget to pizza. The other area is a larger hill for adults and more experienced children. This hill features a slightly steeper grade and a much longer run. The hill has a moving sidewalk to get skiers back up to the top after getting to the bottom of the run so there is no need to deal with the more intimidating chair lifts. Christina had signed up for a group lesson, but since the other person in the lesson was learning to snowboard rather than ski, the two were separated and she ended up in a private lesson as well alongside C. She practiced her snowplough and turns and at the end of her two-hour lesson was exhausted, but happy with her progress. After cheering Christina and C along for a bit, I took some free time to hit the big hills. 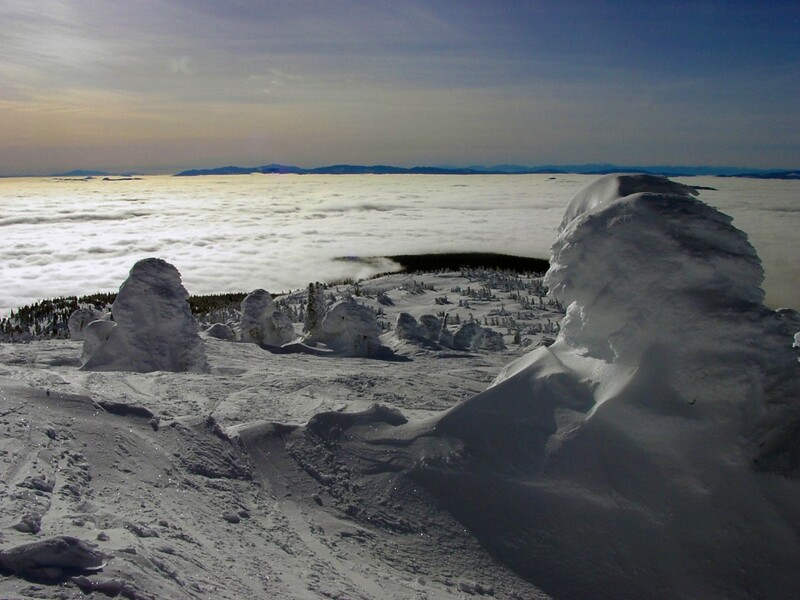 The summit of Big White sits at 2,319 m (7,608 ft) and the runs have a vertical drop of 777 m (2,549 ft). It has 118 “designated” trails and 27 unnamed trails serviced by 16 lifts. 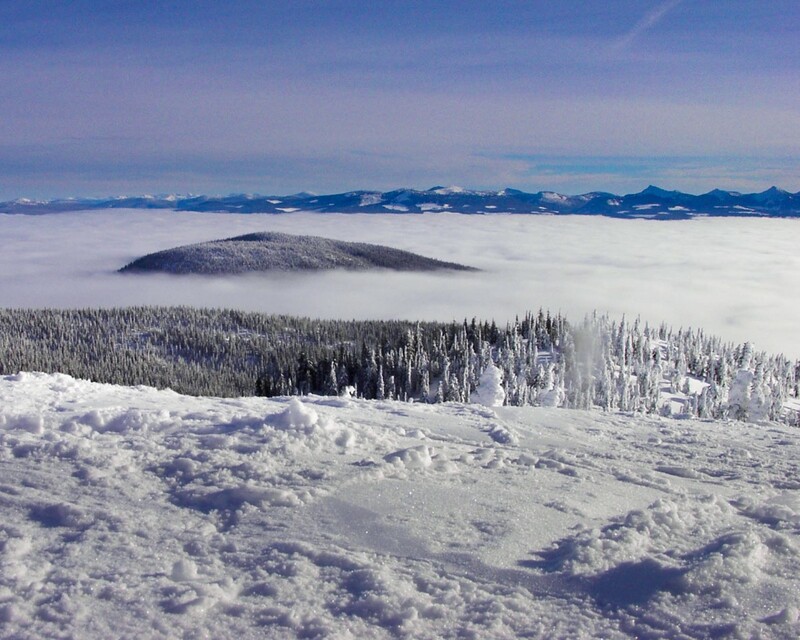 If you love powder, Big White is a paradise, receiving an average snowfall of 750 cm per year. I made my way to the Bullet Express, a fast moving quad chair that brings you to about 3/4 of the way up the mountain and got my gear set up, pausing to take in the breathtaking view of the Big White Snow Ghosts (the tops of trees covered with snow so they look like ghosts floating above the landscapes). I had time for about 4 good runs down the mountain, switching between tree filled runs with soft, pillow-like powder and larger, more populated runs which even though they were considered “busy” rarely had more than a couple of people within view until you got down towards the village. Having only ridden my board once in the last couple of years, I ate a lot of snow that day but loved every moment of tearing down these picturesque slopes. Exhausted at the end of my runs, I went down to meet Christina and C for the end of their lesson and some much deserved hot chocolate. As we made our way up the gondola to the village C asked if we could make time for one more run down Hummingbird before we picked D up. C and I enjoyed playing tag down the mountain and laughing at our all too common wipe outs. We arrived at the bottom of the lift all too soon and quietly enjoyed the view and the company as we rode up to the village. The silence was broken by a couple of young scamps on the ground who decided to start a snowball fight with those of us on the lift. I’d say the snowball fight was a draw. We arrived at the village and went to Tot Town to pick D up. He was engrossed in playing with his new friends. The pick up process for the children in the daycare is a bit un-organized and we stood around for a while before figuring out that there is a name sheet and a signature was needed to pick up D. The lack of security for this part was a little surprising considering the technology used on the slopes but the staff was very friendly and the kids all seemed to genuinely enjoy their time there. 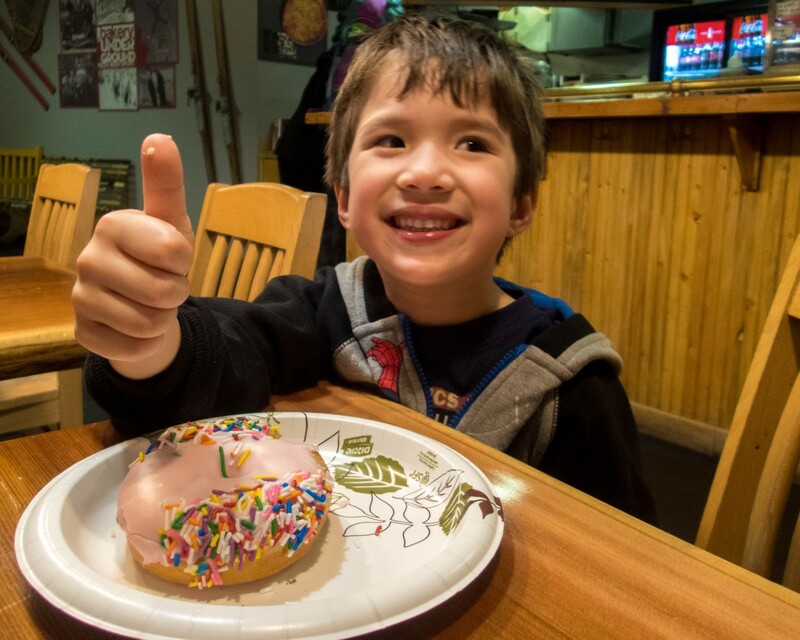 We hit up the Big White Bakery for some hot chocolate and doughnuts to cap our day of fun in the sun and snow and, after returning our skis and board, made our way down the Gondola towards the parking lot. 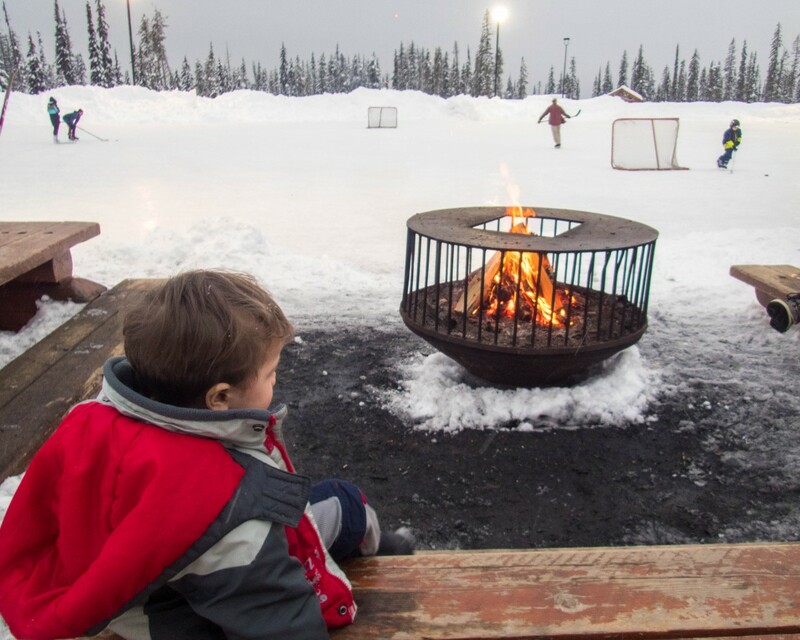 We stopped for a moment by a fire to chat with some of the staff that we recognised from earlier in the day and to watch skaters twirling around the frozen pond. The horse-drawn sleigh that offers visitors rides around the village passed by and the kids chased after it smiling and laughing at the horses and their jingling bells. Getting to the car and taking off all our gear, we got the kids settled into their car seats. As I pulled out of the parking lot, I asked the kids what the best part of their day was and was greeted with nothing but snoring. How fun! I’ve never heard of Kelowna – we usually stick to Europe for skiing as it’s so close to us. My husband has been to Canada for skiing (pre-kids) and he’d love to go back. I’m thinking we will have to add this to our list as its so family-friendly. I literally just tweeted asking for something like this! My boyfriend has convinced me to try a skiing holiday and i’m really not one for winter sports. I want to learn somewhere in Europe, but if I like it I’m going to use it as an excuse to visit Canada again so I’ll think about doing the same as you! Looks like great fun. Thanks! And don’t give up on it, it’s a great way to be outside in the winter! 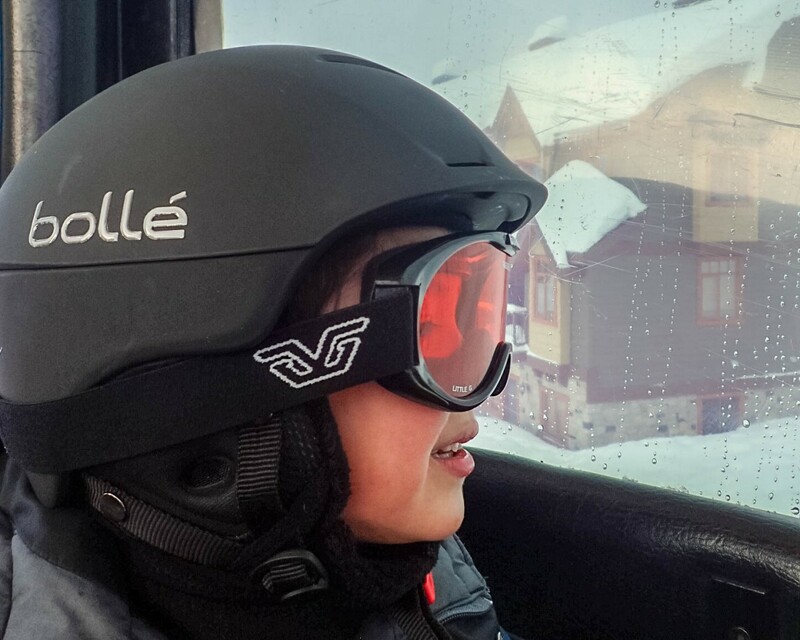 Looks like you had such a fun day and pictures of the kids in their ski gear are so cute! Crazy that it took you all so long to get suited up – 2 hours is a lot of time spent in preparation for any activity (especially with kids) so I can understand your frustrations! I’ve never been skiing before… maybe one day I will learn! Sounds like a lot of fun! I’ve never been skiing but would love to hit the slopes soon! Although it seems really frustrating for it to take two hours to get all the equipment sorted, but looks like it was all worth it! Also, you did a great job with the video! Thank you Kaylene! To be fair, it was only two hours since we had three different types of gear to rent. But it would have been nice to have a one-stop shop. I’ll be going skiing for the first time next year and I’m so excited! Very curious to see how I’ll take to it. Also very excited about apres ski. Nice post! That sounds like a lot of fun! I need to include learning to ski in our bucket list. 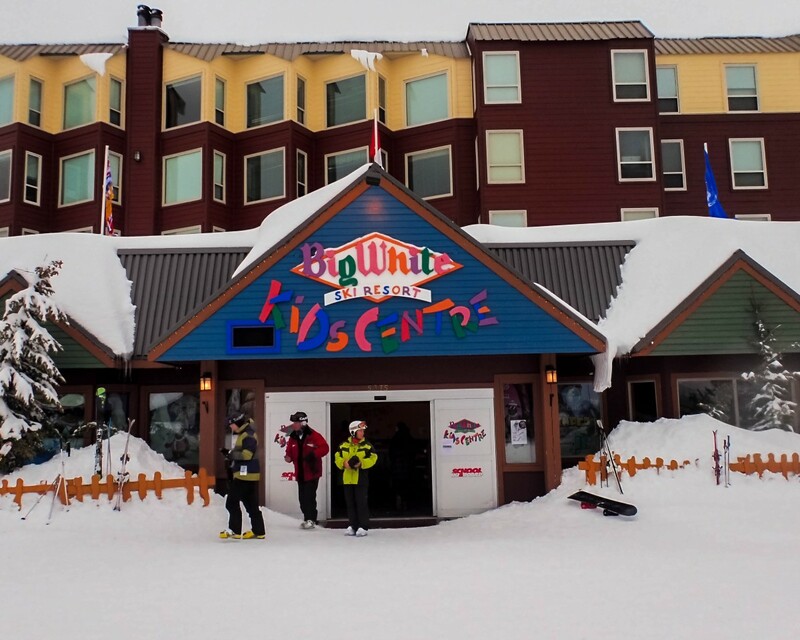 Wow, that last time I was at Big White was 15 years ago. So many things have changed, yet very familiar. Thank you for the updated trip down memory lane. I love Big White! I live in Vancouver and although there are a few local mountains + Whistler that are all fairly close by, nothing beats the conditions in Kamloops or Kelowna 🙂 Powdered moguls on the Dragon’s Tongue trail is one of my favourites! Vancouver is an amazing place! Christina and I made the mistake of attempting the Grouse Grind in flip flops. Turns out it was a lesson in how out of shape we were. I have yet to get to Whistler but I agree, the powder of Big White and Silver Star are incredible! I have what I believe is a healthy fear of skiing. Lol. I don’t trust my own coordination. Well done, Kevin. This is a thorough review & your photos are excellent. Thank you. Such beautiful vistas. That’s what I look like apre-ski as well…out! Hey, glad I found your post on one of the FB travel blog sites. I’m from Minnesota and share the thought that we must embrace winter activities (and winter in general). 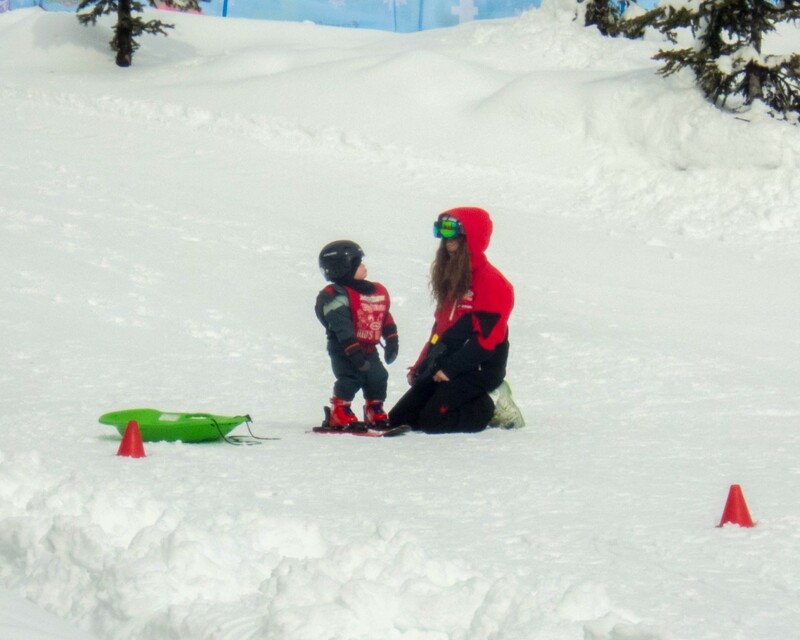 It’s my goal to make sure everyone in our family learns to ski or snowboard also! My 2 little ones learned this season. This was a great story, thanks for sharing! What a beautiful place. FYI – Toronto is on my bucket list . . . will contact you and/or poke around your blog for some kid-friendly things to do soon. Gorgeous family. Hi Beth, thanks for stopping by! That’s fantastic that you guys are embracing great winter activities! I know Minnesota has a lot to offer, although I’ve only been there during the summer months. We are planning on adding a lot of local Toronto content over the next few months so definitely keep checking in or reach out to us and we would be happy to lend our opinion. Big White is a favorite spot of ours. Being from Vancouver, we travel to Kelowna quite often in the summer months. Such a gorgeous place! This looks like so much fun! I have been snowboarding twice (sprained my wrist the second time), so I really want to get some lessons next time. I wish I had learned as a kid but we didn’t have many chances to learn in Australia! Looking forward to moving to Canada soon, having lessons and learning how to finally snowboard (and buying wrist guards). 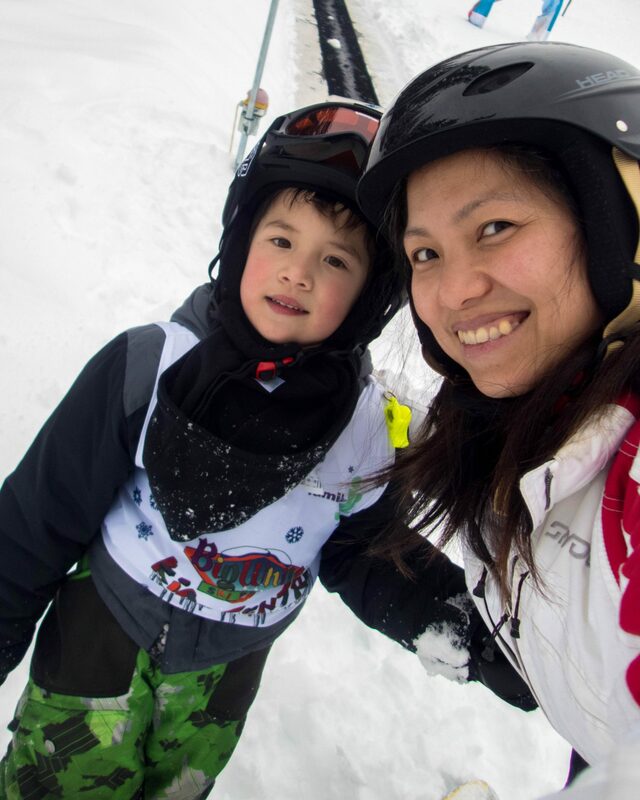 I have never tried skiing and would totally love to do it, I am seeing that your kids enjoy it so much! How fun! We love skiing! Can’t wait til we hit the slopes this winter!